Just got Z68 mobo installed today, everthing fine except 5.1 sound. Using the analog out rear jacks, the sound manager always shows "side" speakers instead of rear speakers, no matter whether I plug the rears into the "rear speakers" jack or the "side speakers" jack. Have unplugged all and plugged in one at a time so jack detection is enabled in the Sound Manager, no joy. Uninstalled Gigabyte/Realtek drivers and installed generic Realtek latest drivers (working fine on my P67 mobo) and still no joy. Plus "Room Correction" no longer shows up when the analog speaker out is selected as default. Searched the net a bit and evidently others have had the same problem with some Gigabyte mobo's, but no fix I've seen. This is make or break for me, I don't want or need a sound card, just for this to work correctly or I'm sending the board back for a refund or swap. Hmmm. It didn't work that way on my P67. I'll give it a shot, though! 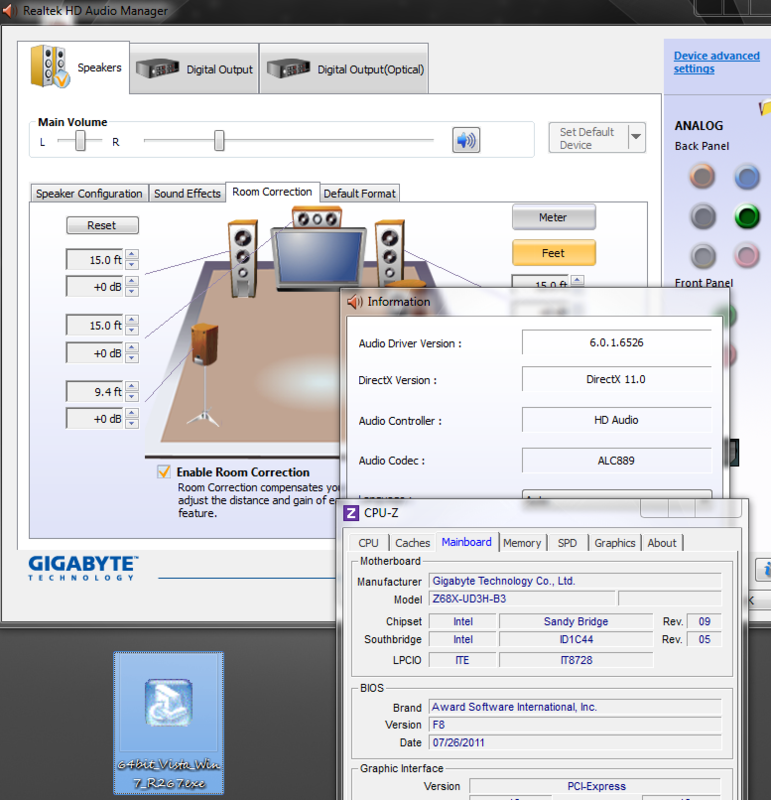 try it and see,have you set up the audio like this? I got the rears working per your suggestion. But I don't have a setup for options like yours (889 codec). Also I don't have the room correction like you do and like I have with my P67 mobo. Without room correction I'm not sure how useful this is going to be for me. But anyway, I thank you for your help. At least all speakers are working now with 5.1 sound. 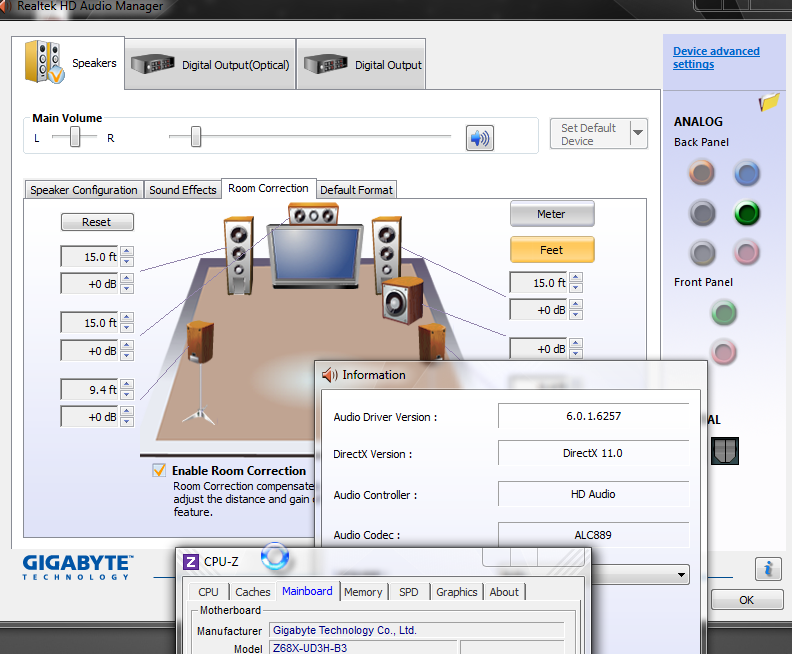 heres room correction,took pics with my phone of z68 sound,does it let you tick the box to enable room correction? see the tick? Last edited by wazza300; 02-01-2012 at 08:26 AM. Yeah, I see how you can click the jacks and bring up the assignments. But, no room correction. Like I say, I got it on the P67 but it evidently doesn't exist on this Z68. Well, I learned something anyway! On the room correction, I see it on Z68-UD3H, so maybe it's just the driver version you are using? Yes, I suppose it could be the board, but I think it's more likely the driver version because I know Gigabyte and Realtek drivers vary from release to release. This is and old version I have installed, R2.55 according to the readme. If you want this version let me know and I can upload it for you, I'll grab the latest right now and test for you (Realtek Download I mean)! Last edited by Lsdmeasap; 02-01-2012 at 12:10 PM. OK, this is R2.67 x64, installed directly over the above mentioned version, and I still have it. The installer actually says it uninstalls the old driver and reboots, then installs the new driver and reboots again, but I said I installed over meaning I didn't manually remove any old drivers. So if R2.67 version is not working for you, uninstall it, and I'll upload that old one I mentioned and you can try installing it and then the latest over it and see if it gives you the room correction or not.